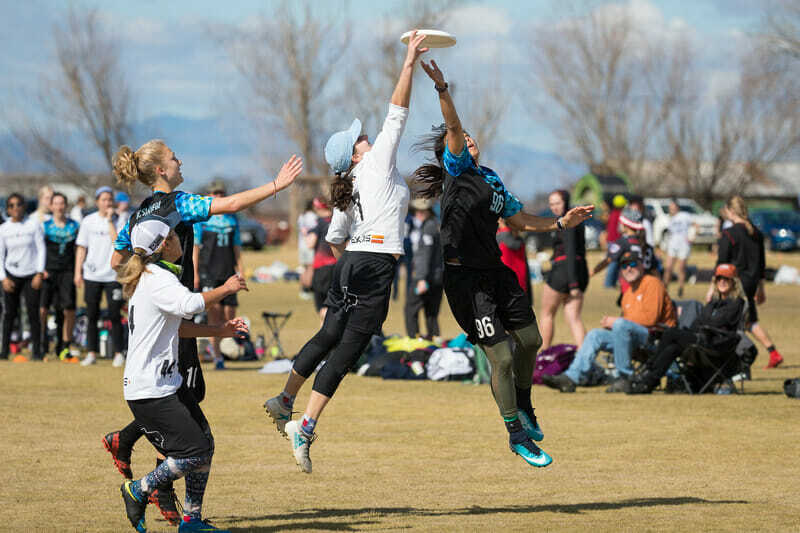 Coverage of Centex is presented by VC Ultimate as part of their season-long support of our women’s coverage. All opinions are those of the authors. Please support the brands that make Ultiworld possible and shop at VC Ultimate! They say everything is bigger in Texas. This weekend that’s not entirely true, as Northwest Challenge will be the premier tournament in action. But Women’s Centex is still one of the biggest women’s tournaments on the calendar every year, and this year is no exception. With plenty of top teams in attendance, nationally impactful storylines, and the ever-present festive atmosphere of Centex, it promises to be a two-stepping good time. So grab your brisket1 and let’s count down to Women’s Centex 2018. Just six of those teams are currently in Top 252, but Georgia Tech, Florida, Iowa State, and Virginia have all been ranked at some point this season as well. Of those, it’s probably Georgia Tech who has shown the highest ceiling, and they’ll want to improve their resume as they prepare for a gritty Southeast postseason. With the field less stacked with the division’s elite, this tournament is more of a proving ground this time around. Austin is my favorite city I’ve traveled to as a member of Ultiworld. This year I fly in on Thursday and will get all of Friday to just enjoy the city. I’m very excited about that. To share that excitement with you, here are nine facts about Texas’ weirdest city. 1) Austin was founded as Waterloo, and chosen as the capital of the Republic of Texas in 1839. It was shortly thereafter renamed Austin after “The Father of Texas,” Stephen F. Austin. It never hurts to know your history, folks. 2) Since 1963, Austin has celebrated the birthday of Eeyore from Winnie the Pooh. It’s celebrated by a day-long festival on the last Saturday of April, which Eeyore would point out would very rarely falls on his actual birthday. 3) Every spring and summer, about ONE AND A HALF MILLION Mexican free-tailed bats migrate to Austin. Apparently that makes the city the largest urban bat colony in North America. 4) Whole Foods began in Austin and was founded by 25-year-old college dropout John Mackey and Rene Lawson Hardy. I thought this one was interesting because who’s ever heard of a 25-year-old dropout before? 6) The city’s well known, unofficial slogan “Keep Austin Weird” was coined by librarian Red Wassenich in 2000 when he spoke the phrase while calling in to a radio show. 7) Austin is visited by 20 million(!) people every year, which is about three million more than the number that visit London every year (!!!???). Between the two divisions of play, players at Women’s Centex will make up about 600 of those people! 8) Austin has nearly 2,000 food trucks. I had to get one food fact in here, and it would have required way too much math to figure out how many pounds of barbecue are eaten in Austin in a day. 9) This one isn’t really a fun fact, but my sister is in her first year of grad school, studying geology at UT-Austin. I don’t get many opportunities to brag about her, so there you go. Now wasn’t that fun? Hopefully you’re as excited about my trip to Austin as I am now. #11 Colorado holds a 6-2 advantage in that time, but five of those games have gone to double game point. Perhaps #8 Texas has the bragging rights, however, after knocking Colorado out in their National semifinal last year, but Colorado took Texas out in the South Central Regional Championship game each of the past two seasons. It’s probably the best rivalry in the division right now and if seeds hold, they’ll treat us to another showdown in the final this weekend. And they’ll all be available for free on YouTube! Hopefully Nguyen will be able to take the field this weekend after missing time earlier this year due to injury. Very few players in the division are capable of what Nguyen is capable of. She’s an athletic dynamo who brings the fireworks wherever she goes. It’s well documented that Texas lost some big names from the team that made the National final last year. But Gerencser was a big part of that team too and she’s still around. She has big throws, is an absolute workhorse in the backfield, and embodies Texas’ gritty style as well as anyone. Most standouts at this level make their biggest plays on offense. Willocq is a nice offensive player, but she makes her biggest impact on the defensive side of the disc. She was one of the stars of Centex a year ago, locking up some of her opponents’ most dangerous offensive weapons. I just wrote a feature story on what makes Jezierski so fun to watch. Check it out! Having played at a Club Nationals level since 2015, Kokinos is one of the most talented players in the division. She missed this tournament a year ago, but should be one of its biggest stars in 2018. Cessna was a big-time goal scorer on the U24 US national team back in January. She’s asked to do a lot for Colorado State, but she’s one of the most talented players in the division. 1) Will #11 Colorado bounce back? Kali had a disappointing performance at the Stanford Invite. They finished third in their pool, last in prequarters, and wound up finishing 9th overall. They were without Nhi Nguyen, and she could make her return this weekend, but it was still an underwhelming performance from the team that entered as the number two seed. This weekend they’re number one, and the competition won’t be as stiff. But anything short of a dominating pool win and an appearance in the final will probably feel like another disappointment. 2) Can #19 Colorado State keep their momentum? #19 Colorado State is the no. 3 seed in Pool C, but they come into Centex with a bit of momentum. They made it to the final of Midwest Throwdown earlier in the month, and beat #20 Minnesota and pool no. 2 Wisconsin along the way. If they can channel their Throwdown performance into this weekend, they’re a good bet to break seed, and perhaps even give one of the top four a scare. 3) Will one of the Southeast teams increase their stock? Georgia Tech and Florida have fallen back a bit of the pole position on the Southeast. #22 Auburn took that spot at Tally Classic two weeks ago, and Georgia feels like they have the two spot in the division’s power rankings. But Tech and Florida are both still very much in the picture. Both teams showed some promising signs at Tally, Georgia Tech in particular. If either or both put together a solid performance in Austin, it will help set the stage for what could be a wide open Southeast Regionals. 4) Will UCLA and/or Virginia be able to turn it around? #23 UCLA BLU and Virginia Hydra have been mainstays on the national stage for years. Both programs saw heavy attrition from last year’s rosters, but their falls this year have been shocking. It’s now getting to be a desperate stage in the season, and if they don’t show signs of improvement this weekend, it will be difficult for them to feel confident of stealing a bid come the series. 5) What will happen with the bids? The top four seeds all seem pretty safe. It would take something really drastic for them to lose their bids, now. But there are a couple of teams on the edge of the cutoff who will be fighting for strength bids this weekend. Washington University currently sits at 22nd in the rankings; Wisconsin is at 24th, with few games played. They’ll need to climb more than a few spots with so many auto bids outside of the top 20 this year. But with those top four all in the top 13 in the rankings, there is a possibility to make some big moves for a couple of teams who will likely need that extra bid to have a chance at making Nationals. 4: Top 4 Seeds That Will Win Their Pools? Centex has a different format than it has had in years past now that Without Limits is no longer running the tournament. Gone is the Power Pool tiered structure we’ve had in the past. It’s a much more conventional format this year, with teams that used to be separated into two separate tiers all competing in four different pools. That means the top teams are spread out quite a bit more than they’ve been and it takes away some of the high-profile matchups we used to get on Saturday. Upsets are always still possible, and with the new format there is potential for more and bigger Saturday upsets than we’ve had. But it also makes it more likely that pool play will be more chalky, and that the top teams on paper will reign supreme by the end of the first day. In other words, they’re going for a threepeat. What’s crazier is that they had never won the tournament before this current stretch! 2016 was the first time Melee ever won their home tournament. Texas did last year and UC Santa Barbara did it back in 2011. Both teams were no. 1 seeds at Centex. For Texas, Centex was famously the only tournament they won in 2017, while UCSB was able to roll their Centex victory into a national title. The Centex Dance-Off is one of the best traditions in ultimate, and is deserving of almost as much excitement as the tournament itself. I nearly nailed my winner pick last year. I made something of a dark horse selection in picking Florida. Though they did not win, I feel as though my bold prognostication was redeemed by their impressive second place finish. This year I’m taking UCLA to take the top spot. Their audition video showcases a small amount of dance talent and a lot of moxie. Both of those go a long way in this competition. And there’s also a tradition of California teams taking home the dance-off hardware. So don’t let me down, BLU. My Ultiworld credibility depends on you. Daniel Prentice is a Senior Staff Writer at Ultiworld. Daniel is a product of the Tallahassee ultimate community and has been writing for Ultiworld since 2015. You can follow him on Twitter @danielprent. Comments on "Women’s Centex 2018: Tournament Preview"